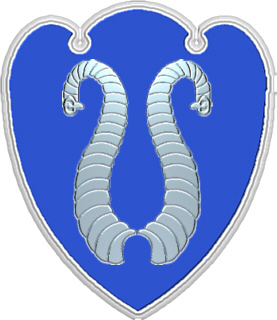 A blue shield charged with two silver trunks. 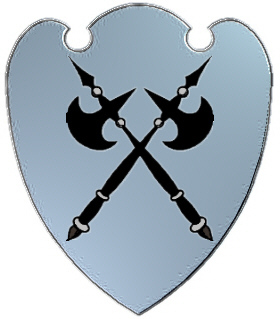 Coat of Arms: Silver with two crossed black battleaxes. Crest: An arm holding a battleaxe emerging from a crown. Motto Translated: Woe to the timid. Madison, Maddison, Maddeson and others. Scottish and northern English: patronymic from a pet form of Matthew. English Mattisons: First found in Durham where they were seated from early times and their first records appeared on the early census rolls taken by the early Kings of Britain to determine the rate of taxation of their subjects. Some of the first settlers of this name or some of its variants were: Isaac and Mary Maddeson, who settled in Virginia in 1623; Captain Maddison, who settled in Virginia in 1626; John and Mary Maddison, who settled in Virginia in 1624. 1032. Mattis RASMUSSON was born Abt 1607 in Vastra Karaby,Malmohus,Sweden. 1033. Mrs RASMUSSON was born Abt 1630 in V. Karleby,Malmohus,Sweden. 516. Jons MATTISSON was born Abt 1658 in V. Karleby,Malmohus,Sweden. He died 6 Oct 1712 in Vestra Karleby,Malmohus,Sweden. He married Bengta Jonsson 10 Jan 1691 in Vestra Karleby,Malmohus,Sweden. ELEPHANT: This heraldic symbol denotes great strength, greater wit and greatest ambition. The Elephant was the ensign of Cyneus, king of Scythia, and Idomenes, king of Thessaly. Elephants are the bearers of kings and queens and so a symbol of royalty, prosperity, temperance, dignity, and power. In 250 BC, Pyrrhus, the king of Epirus (now North Albania), with an army of 25,000 men and 20 Elephants won a hard-fought victory over the Romans at Heraclea. At a crucial phase of the battle, Pyrrhus ordered his Elephants to charge and it was too much for the Roman legions. The Romans had never seen Elephants before and called them 'Lucanian Cows'. The Elephant was the totem animal of the god Shiva, the Destroyer, who seeks to banish illusion and to encourage a clearer perception of reality. Elephant. A Quadruped. A very appropriate bearing for those who have distinguished themselves in the East, and is of common use in Armory. Elephants are borne in Coat Armour with and without Castles on their backs. The trunk is also frequently met with as a bearing, and is always blazoned a Proboscis. Proboscis. The trunk of an elephant.